The Tactical Light Mount Kit ™ it is your BEST solution for attaching a flashlight or laser sight to your Mini. Add a pistol scope or red-dot sight and you have one of the fastest handling scout carbines ever assembled! Our Tactical Light Mount Kits will fit ALL models of Mini-Scout-Mount. 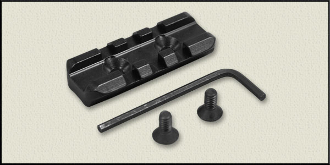 The 1913 Picatinny Short 2.0 model is 2.0 inches long and secured by two 8-32 screws.